This dust plug set is made from premium silicone and fits perfectly with smart phones & laptops. Protect from liquid, sand, dust, grime, pocket lint and more without a bulky case. It\'s never been easier to quickly and effectively protect the ports of your favorite smart device - all you need is this one simple accessory. The connector is suitable for laptop, MP3, MP4 or other device with micro USB earphone. These anti-dust stoppers are built with high-grade silicone making them tear resistant and durable for frequent use over a long period of time. Perfect for use Wireless Charging pads. 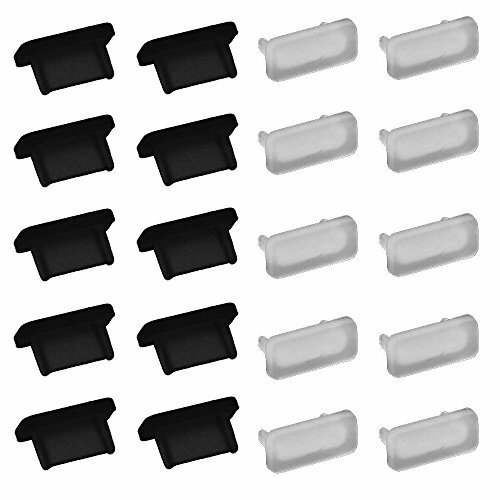 Firm silicone makes for a perfect fit, so you can easily insert and remove these dust plugs. A slightly ridged external surface means they stay firmly in your device at all times, and don\'t get pulled out easily.